aFe Control is proud to introduce the PFADT Series Stage 3 Package. This package is the ultimate track package and features Featherlight Single Adjustable Coilovers, Race Sway Bars, Solid Pillow Mounts, Spherical Control Arm Bearings, and a Camber Kit to turn your car into a track beast. The mono tube coilovers are precision CNC machined from 6061-T6 hard anodized aluminum and assembled in our Corona California production facility. The CIRC (Concentric Integrated Remote Canister) System more than triples the gas volume over a standard coilover and houses the BOA (Ball on Axis) upper mount, which allows full articulation of the suspension. To further reduce body roll and improve handling, the Stage 3 package includes the ultimate 3 piece race sway bars which utilize a 4130 Chromoly torsion bar with splined ends. Both front and rears bars feature lightweight 7050-T7 aluminum arms that feature broached splines and laser etched, adjustment markers. 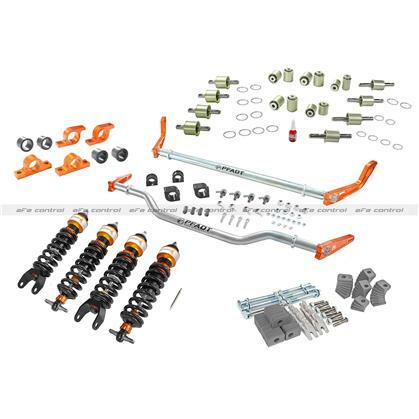 Both front and rear sway bars are three position adjustable giving you 9 different sway bar rate combinations. To eliminate bushing deflection, the system replaces all 18 control arm bushings with mono-ball, spherical joints to eliminate friction and features 6061-T6 housings CNC machined heat treated 17-4 PH stainless steel shafts, and CNC machined 6061-T6 articulation spacers. To maintain proper track alignment, the camber kit was designed to replace the factory alignment eccentrics with precision water jet cut aluminum degree indexed spacers to positively lock alignment settings in place without the risk of slippage common on track driven vehicles. The PFADT Series Stage 3 Package was designed to be the ultimate suspension package for racecars competing around the world and you will find a new level of responsiveness and corning grip that was never before possible.